The center anchor of the Titanic weighs 15 ½ tons and was fabricated by Messrs. N. Hingley & Sons, Ltd. Of Netherton, Dudley, Worcestershire. 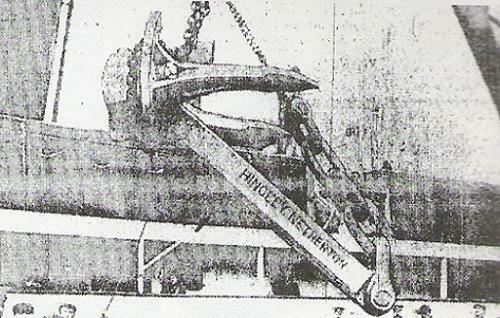 Typical of the manner by which the many and varied components for Titanic were assembled is the transport of this huge anchor from its place of manufacture to the Harland & Wolff Belfast yard. London and Northwestern Railway Company’s own team of sixteen horses carted the casting from Hingely’s Northern Iron Works to the Dudley Station. From there, the anchor, together with its links, (each 2 feet 6 inches long and weighing 500 pounds) was carried via the London and Northwestern Railway to Fleetwood where it was loaded on a 40-ton platform and hoisted aboard the Duke of Albany for its trip across the Irish Sea. The anchor and the chain arrived at Albert Quay, Belfast at 4:50 a.m. on Friday, May 5, 1911. It was unloaded onto a large lorry owned by Messrs. John Harkness & Co. to make the short trip to the No. 3 Slip at the Queen’s Island Yard. Here it was hoisted aboard the nearly-completed Titanic and installed in the well on the deck immediately abaft the bow. Dimensions-length 330.9 ft., width-41.1 ft., depth-17.1 ft., poop-84 ft., bridge-148 ft., foc’sle – 70 ft.